so you’ll be in the loop when the site is back up and running 100% :). Of course, I always appreciate your feedback so if you’d like, go ahead and let me know what you think of the new style! What are some of the first steps a business owner should take when creating his or her digital strategy? I shared 4 tips to better reach your target audience during an interview with Andrea Genovese of Wind Business Factor. The video is in Italian, but the original transcript has been translated into English below by my team at itive.net. Enjoy! When a business owner is going to use the web for the first time he or she should keep a few important things in mind. First and foremost, a business owner should no longer think of the web or “digital world” as something disconnected from the real one. Today, the web is constantly evolving. And a consumer and a business owner can do business exactly as they would if they were downtown “IRL” (in real life). First, the most important thing to understand is where you are as a business and where you would like to go. Therefore, at this initial starting point there is a need to create a digital strategy that will allow you to reach your goals. Second, you should analyze the tactics that will be utilized to achieve your objectives and reach the finish line. After that, you could reach out for support from somebody who has experience in this arena. It could be a web agency like us at itive.net, it could be an external consultant, an online communicator who in a certain sense could help you move through these “first steps” of the digital world. Before you start to do any of this, though, be silent and use these, one of the most important organs we have, your ears. You have to listen carefully in order to learn about what is happening in your niche market. You have to be attentive listeners and figure out the dynamics that are in your market, as well as to identify the needs of your consumers. Once you understand the current situation within your market, you should contribute to the conversation and become an active member who interacts with the digital communication dynamics that are already taking place in your field. If you’re interested in creating your digital strategy with us, feel free to contact us or go ahead and click here to fill out a “get started” form and we’ll help you get there! 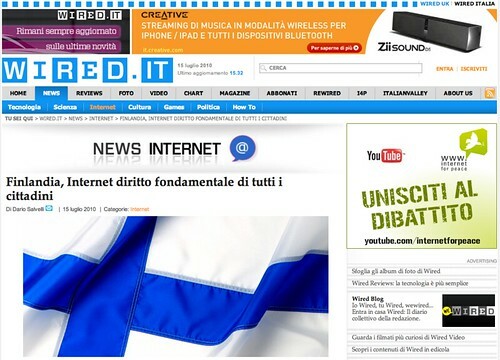 I’ve been interviewed by Dario Salvelli for Wired Magazine about Finland and the recent announcement (1st of July 2010) of the legal right for every Finnish citizen to have access to a 1Mbps (megabit per second) broadband connection. Enjoy it and as usual feel free to share your thoughts with comments or via twitter @vascellari! (please remember to link back to this post so it will be easier to track and aggregate the conversation, thanks). Italy, 2010. Families with no PC were reduced by only 2% in the last 8 years, yet new families subscriptions of users that are willing to pay a surcharge on fees just to have a connection to 100 Megabit grew of 40% and about 78% of households with broadband access has at least one child under 18 years old. An incentive to implement the NGN (next-generation high-speed network) in Italy and not wait for the 2015 deadline set by AGCOM to assign broadband services to reduce the digital divide. In this context, is it possible to imagine a law that includes the Internet as a fundamental right for Italian citizens? Other European countries are heading in this direction. On July 1, Finland became the first nation in the world in which every citizen has the right to access the Internet with a minimum of 1Mbps connection. This law will serve about 4000 Finnish families that still suffer from digital divide and will force providers to install cables out in Finnish rural areas where 5.3 million people live. The village of Karvia this year will already have a 100MB connection. The plan of the Finnish Government is in fact broader and plans on providing access to 100 Mbps in 99% of the territory available by 2015 by using fiber optic and agreements between mobile operators who already use UMTS900 technology to build and expand the NGN. Anne-Mari Leppinen is Finnish and works for Suupohjan Seutuverkko [disclosure, Suupohjan Seutuverkko is itive‘s client], a company owned by six local municipalities (an area of 3700 km2 for a total of 30 000 persons) which aims at building an open fiber optic network that is already among the fastest in Europe. The purpose of this company is to build the network and use it but not to offer services: all the service providers have the same opportunities to provide services to clients on fiber and users can freely choose who to trust. The network built in the city and region of Kauhajoki can already replace all the data traffic such as broadband, cable, satellite, digital TV and phone connection. In addition to this in Kauhajoki the fiber is used to improve the efficiency in real estate surveillance, remote control of industrial production and it also enhances the quality of life of the elderly people that live at home. Finland is not the only European nation that looks at the Internet as a civil right of citizens: In France, the Supreme Court has ruled that Internet access is a right, while Spain and the United Kingdom have similar laws in the pipeline that should be approved respectively in 2011 and 2012.